Echinacea sunrise has buttery flowers that fade to white. Echinacea sunrise plants are a wonderful choice for people who like coneflowers but want something other than the classic purple flower in their garden. Coneflower is the common name for the species of flowers also known as Echinacea. They are perennial plants that can generally be planted either in the spring or fall, in full sun or light shade. Plants usually range in size from three to four feet, though there are also dwarf varieties that only grow up to about two feet. They are hardy from planting zones 3 to 9, meaning most people can successfully grown them no matter where they live. 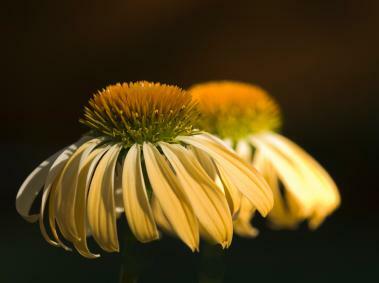 Coneflowers like a well-drained and fertile soil, so you might need to amend your soil with compost or use a high-quality fertilizer to get your plants started. They don't like to have soggy roots, so the well-drained soil is really key. They can also be grown in containers, and are great for picking and drying. Echinacea plants bloom through the summer into the fall and are best grown from purchased plants or seeds. Gardeners are often unsuccessful trying to grow plants from seeds taken from flowers already in the garden. You can propagate your own coneflowers by dividing the root ball of an established plant. Echinacea attracts songbirds and butterflies, and rabbits like to eat them. They are, however, deer resistant. Echinacea sunrise plants are a relatively new cultivar that has lemon yellow flowers with a central cone that starts out green and turns gold as the flower matures. The flowers are wide and the petals slightly overlap. The color of these flowers tends to fade to a creamier white in very hot sun, so your flowers may have a mix of yellow and white petals depending on where they are planted and how the climate is where you live. The shape of the flower is similar to a daisy. These are lovely flowers for a border or your cutting flower bed. One of the best things about Echinacea sunrise is that the flowers have a rose-like fragrance. This makes them nice to have in the front of the flower garden, where you can smell them. They grow to between 30 and 46 inches tall and spread 18 to 24 inches. They are hardy in zones 3 to 9. Echinacea sunrise plants were developed as a cross between the classic Echinacea purpurea and Echinacea paradoxa. Another variety developed from the same cross is Echinacea sunset, which is an amazing orange color with a brown cone and the same delightful fragrance as the sunrise cultivar. The sunset plant is a little smaller than sunrise, growing to 24 to 30 inches tall. Both plants have full, toothed leaves, wide petals and a vigorous growth habit. Any Echinacea plant is a good choice for the flower garden, especially if your garden tends toward wildflowers (or at least the look of wildflowers). Many of these flowers will also attract butterflies, hummingbirds and beneficial insects to your property, which is wonderful if you also have a vegetable garden nearby. You might want to plant a butterfly garden to bring even more of these beautiful creatures (and beautiful flowers) into your yard. Once established, Echinacea doesn't need a lot of extra attention and can tolerate less water than it can at the beginning of its life. Echinacea sunrise (and sunset, for that matter) are two big winners when it comes to adding an unusual coneflower to your garden that is sure to get noticed by all of your flower-loving friends.